This month’s crocodile post asked our readers to think about some interesting designs appearing in and on our books. The first, appearing on the covers of Folger STC 11011 copy 2, are two slightly different designs with a central shape made out of six adjoining loops, surrounded by widening concentric circles. The second is a similar design, but lightly traced on the flyleaf in STC 16878 in pencil. Unfortunately, I’m here to tell you that there isn’t a certain answer to what these marks are, only more questions. I first noticed these marks in the fall of 2016, when I was helping to clean our collection of English books in preparation for moving them to a different vault. 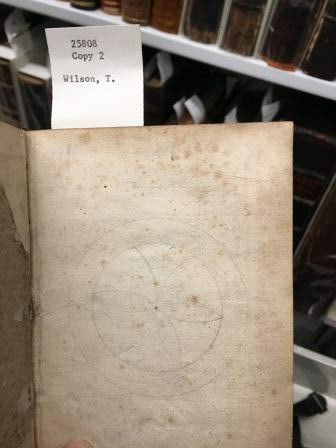 I’d seen this strange, six-petaled, circular design on a few different books when I happened on a tweet from Historic England asking the public to search their homes for “witch marks.” Attached to the tweet was a picture of the six-leaved symbol in concentric circles that made me so curious. Intrigued, I learned that marks such as these are well known and documented in the world of architecture and archaeology, where they are referred to across different publications as hexfoils, hexafoils, witch marks, triskeles, marigolds, and daisy wheels. According to archaeologists, the marks appear all over the United Kingdom on early modern barns, grain stores, entrances to homes, on furniture, on church walls, and even on beams inside the Tower of London. The symbol itself, as well as different variations on it, are much older than the sixteenth century, however. Medieval examples abound in churches as graffiti, as well as being used as the main decorative motif on items such as baptismal fonts (see the last linked article, from the wonderful Norfolk Medieval Graffiti Survey, for images). Before that, the mark was also used in Roman Britain, with examples spotted on Roman grave markers in the British Isles (see illus. 6.9 in Charles-Edwards, The Origin and Development of Insular Geometric Letters, Bangor: 2006). It even pops up on barns built by the Pennsylvania Dutch, on homes in late-18th century Australia, and in New England graveyards, as well as being found on the Continent. Archaeologists have debated whether or not this mark is an “assembly” marker (meant to help builders fit the right pieces together) or something else for some time, but the most recent literature advances the idea that these marks are meant to be apotropaic (protective against evil or malign influences). Of course, when Historic England announced that they wanted the public’s help looking for something called a “witch mark” on October 31st, the public was extremely excited. Newspapers, popular history blogs, and all of twitter picked up the call. Historic England was flooded with over six hundred separate submissions of witch marks on homes in the United Kingdom. 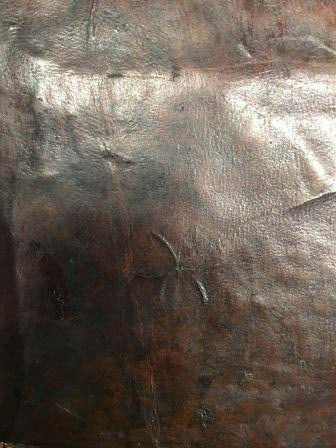 But my curiosity was partially dissatisfied: no one was talking about finding these marks on books. STC 21036b.2, a copy of John Rider’s “Dictionary” (or “Bibliotheca Scholastica”), published in 1640 (photo by Elizabeth DeBold). Wing H3179, a sammelband of 90 (yes, ninety) Quaker pamphlets bound together, published between 1657 and 1673 (photo by Elizabeth DeBold). STC 25808 copy 2, “A discourse upon usury” by Thomas Wilson, published in 1584 (photo by Elizabeth DeBold). A tiny example, similar to the one appearing on STC 25808 copy 2, on STC 25884, “A dictionarie in English and Latine for children, and yong beginners” by John Withals, published in 1602. Photo by Elizabeth DeBold. STC 16878, “A manuall of devout meditations and exercises : instructing how to pray mentally,” a Catholic prayer manual translated into English and published in 1624 (photo by Elizabeth DeBold). Perhaps the most impressive specimen, or certainly the most eye-catching, STC 11011 copy 2, a work on surveying by John Fitzherbert, published in 1546 (photo by available in LUNA). So we are left with more questions than when we started. What does the hexfoil mean when it appears on a book? Is it practicing a skill, apotropaic, or merely decorative? Does it mean much the same thing it would mean when placed in a doorway or on a linen or clothes chest, 0r was utilizing this mark on a book different than utilizing it on a building? How does this inform or change our understanding of how early modern people thought about books as possessions or objects? Since hexfoils regularly appear at entrances of many buildings, on baptismal fonts (a type of entrance, it could be argued), or wooden chests that open and shut, are the covers of the books also viewed as a type of entrance (romantically speaking, the “gates to knowledge”)? 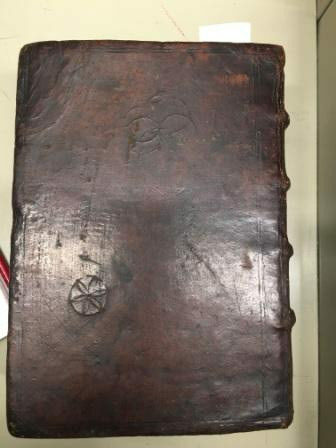 In this case, is the mark protecting the book (against theft? ), the person reading the book, or all of the above? Did having this mark on a book make a convenient traveling charm, since it could move with the person carrying it? 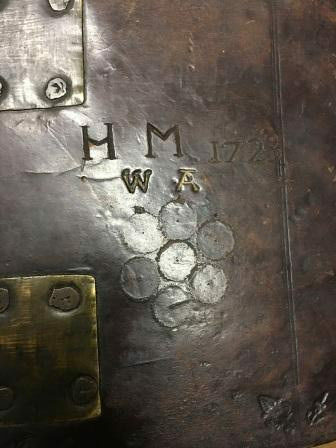 All of the books shown above are in near-contemporary bindings, making it more than possible that these marks were also made by contemporary owners. 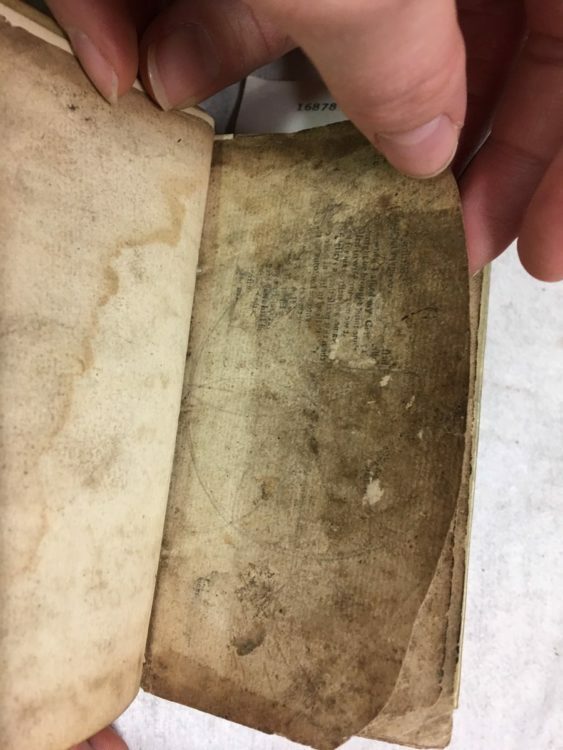 We also need to take into consideration the fact that the majority of these marks were made on buildings during the early modern period, and so far I have located no such marks on later book bindings. 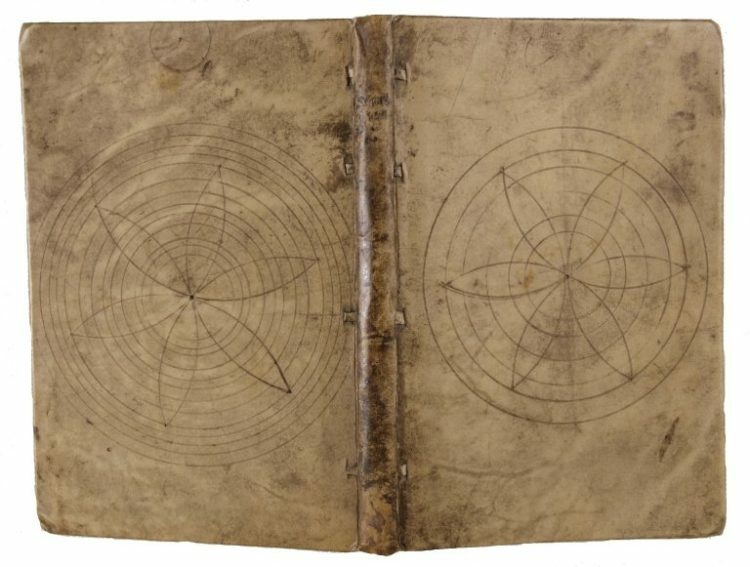 As some readers suggested, I’ve considered that books were being used as convenient places for practice with a compass, especially since one of the examples I first encountered was STC 11011, a work on surveying (though perhaps any book would do, particularly if someone wanted to have their mathematical works open while they practiced—topic doesn’t seem to bear any relation to the presence of this symbol, as one of the comments noted). Books do provide a firm, flat drawing surface, and were clearly often used as places to practice penmanship based on the amount of scribbling, repeated phrases, and alphabets that appear on flyleaves from the early modern period. The proliferation of this specific symbol from Roman periods up through the eighteenth century, however, argues that something else may be afoot beyond simple practice or decoration. As archaeologists and historians of architecture have argued already, although specific meanings attached to the symbol have likely changed over centuries or been forgotten, the hexfoil has clearly retained its meaning as a general ward against bad luck (much like an evil eye or pentagram), and was placed on items and in locations the person placing it hoped to keep safe. I am continuing to investigate and (slowly) assemble a record of books with this symbol at the Folger, and much like Historic England, I would be interested to learn whether anyone else has noticed similar symbols, either in the Folger’s collections or in other collections. Feel free to email me at edebold@folger.edu or tweet me at @eliza_audacis with your finds! Although I couldn’t answer this crocodile mystery for you, I hope you’ve enjoyed considering these hexfoils with me! Timothy Easton. “Apotropaic Symbols and Other Measures for Protecting Buildings Against Misfortune” in Physical Evidence for Ritual Acts, Sorcery and Witchcraft in Christian Britain, Ronald Hutton (ed.) Palgrave Historical Studies in Witchcraft and Magic. London: Palgrave MacMillan, 2015. Michael Champion. Medieval Graffiti. London: Ebury Press, 2015. There’s no denying that witchmarks or symbols against evil exist, but hexfoils? We drew them as children with no motive but the fascination of creating them. You could do it with compasses or simply using a coin. They had no meaning at all. Thanks for commenting! It’s certainly another possibility. Since these marks do appear in increased amounts on buildings and walls during the early modern period (the time when they were made was found through both dendrochronology and by the specific tools used to make the marks), and have been identified by multiple archaeologists and historians working on architecture as apotropaic in that context, it seems worth exploring other possibilities. Authors who I read writing from the UK did note that they talked to friends who drew these designs themselves as children, but as I mentioned, symbols lose and gain meaning at different times in different contexts. What may have been a fun doodle for you might have meant something very different to an early modern person. We may never know for certain exactly what someone meant (or didn’t) when they drew this design. And, thanks for the info about coins being used—most authors seem to approach these as being made using compasses, but it makes sense that someone would have used a coin, especially for some of the smaller varieties! I think context, or location, is also important. A doodle on the flyleaf of a book could be a meaningful symbol on the beam in a church, or vice versa. A thought-provoking article. This may or may not be relevant, Elizabeth, but the fourth book of Euclid’s Elements (problem 15 – inscribing an equilateral hexagon in a circle) effectively teaches how to draw this shape. Of course that doesn’t explain why anyone would want to put it in or on books, but it might to some extent explain why it’s so widespread during the early modern period, because a lot of people would have studied Euclid.